I love these sheets. I ordered 2 sets of Twin XL, and have no complaints. I am always a little skeptical ordering sheets I can't actually have a hands on feel, but was not disappointed with these in the least. They wash well, the fit is GREAT, the fish print is a fun change for us and they aren't all wrinkled up when they come out of the dryer. Cool and comfortable to sleep on in the summer, ...and winter. I would definitely order more of these sheets. Twin XL sheets were not always that easy to find, but Overstock has put out ample options at reasonable prices. Would definitely recommend, especially to those who are as skeptical about not having the real visual and hands on feel...you won't be disappointed...honestly stated. Add a fresh a clean look to your bedroom decor with these deep pocket sheet sets. These sheets are available in various sizes and colors that will easily match your existing decor. Constructed with a 100-percent cotton weave you will get the clean and attractive look you have been searching for. Dimensions 19.0 In. X 12.0 In. X 16.0 In. These sheets are fantastic and just what I have been looking for. I feel like such a goofball, because I thought these kinds of sheets were just not made any more. I've paid a lot of money for sheets, and they are always so soft, which I don't like. These are perfectly just sort of a crunchy feel to me, especially since I hang them up on my portable outdoor clothes line. I have longed for climbing into a bed made with these kind of sheets and I have finally found them. They are not so rough, but just the right amount of crunchy to remind me of my childhood bed. There is hardly a better feeling in the universe than crawling into a bed freshly made with these sheets! Also, just to let you know, the sheets are very generous in size. I purchased the queen size, and they have DEEP pockets to fit around the bottom of the mattress easily, and do not "ride up" from the corners so far, and I've had them since early March and it's close to the end of May. The colors are still bright and beautiful. The set comes with only one pair of pillowcases, and since I love my pillows, I had to order a couple of sets of pillowcases from another brand here also on Overstock. The other brand has a beautiful print that coordinates, but the thickness of the fabric is not as strong and substantial and borders on the soft side. Bottom line is this: If you love and crave the crispy clothesline dried sheets from your childhood, these are the sheets you need to get. I am so tired of thin, pilly cheaply made sheets. These are the best reasonably priced sheets I have found, and I love them. They will last. These sheets are a good weight and have a smooth hand. The top sheet has extra length for a generous tuck. Barely a wrinkle right from the dryer. Very fine quality. I’m resting on this sheet set as I write this review. These sheets are comfortable and cool to sleep under. The elasticized fitted sheet holds well, even with a 3 inch topper on the mattress. No shrinkage noticed after washing and drying. Very pleased. These sheets are beautiful and of excellent quality. Wash and dry nicely. These fit great on the 11 inch Christopher Knight Home aloe gel memory foam mattress over a mattress protector. Would purchase again! I love these. Nice smooth 100% cotton. The flat sheet covers our 14 inch thick mattress with ample hang on each side and plenty to tuck in bottom. I've had trouble finding 100% cotton in stores so I was pleased to find these here. The red stripe goes well with our country them bedding. Close enough to red ticking stripe that was wanted. Easily mix & match with plaids & patchwork. 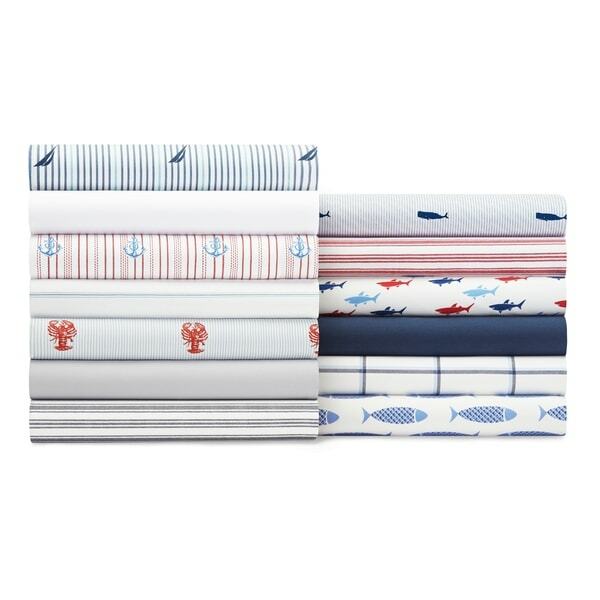 The Nautica Percale Deep Pocket Sheet set is amazing. It’s hard to find sheets that are soft and luxurious feeling, and not paper thin. These sheets are prefect. Deep pocket seems to be a relative term, but with these sheets they fit my 14 inch mattress. Another area these sheets excel is the elastic. I detest a cheap flimsy elastic. These elastic is of superior quality!. All in all after I slept on these sheets, washed them repeatedly I bought another set! That says everything. I like these sheets, but they are not wide enough. Price was right, but I would not buy again. I was back and forth on whether to buy these sheets. I am a hot sleeper so I do not like anything heavy but I still like a sturdy feel to my sheets. This set is perfect!! I purchased a queen set in the Coleridge Charcoal color which is a dark blueish grey stripe. My only complaint is that the flat sheet is not wide enough to be tucked under the mattress on both sides of the bed. But I can live with that, I suppose. We do not like soft sheets because my husband thinks that they feel old and worn out. These are not extra crispy, but just right and out of the dryer they feel like they could have hung on the line for awhile. These are the perfect fit for our extra deep mattress. I wanted to love these sheets- they are supposed to be 100%cotton but after about 6 months of use one of the sheets started pilling and so I have been disappointed and wondering why they are doing that they also come out of dryer quite wrinkled - so I really can't. Recommend this item- and I actually bought 3 sets in the beginning as I thought they would be so nice. I have washed these sheets about 5 times all ready and they are not comfy in to sleep in. They are Hot and stiff.. I have used fabric softener also and can't get them to soften up.. they are a beautiful accent to the navy comforter I bought but so far do not like these sheets at all. I bought these for my son and he loves them. Comfortable, fit the mattress well, and looks great. These sheets are the best sheets I have ever bought. Thank you so much. A PERFECT pair of sheets! Great quality. Percale is a must! Finally, a light and crisp 100% cotton percale sheet! They are hard to find, but these are just like the ones my grandmother used to hang out on the clothesline, that felt great next to your skin and smelled so fresh. The quality of these sheets is excellent and with elastic on all sides of bottom sheet, fully cover our 15# mattresses. Just beautiful..we love them! good quality, colors are nice and looks very good in a child's room. have not washed them yet so cannot attest as to the fade resist quality but i think it'll be ok. Very nice sheet set washed beautifully and are soooo comfortable, great purchase. I love these sheets!! Nice and crisp, remind me of my childhood. Would definitely recommend. No micro fiber for me! They are soft and just what I ordered. Thank you. I read the description of these sheets on overstock and thought it sounded like exactly what I was looking for, good old fashioned percale. You'll notice percale is even mentioned in the product description on this review. I might mention that this was my first purchase at overstock. I received the sheets and the first thing I noticed was the word percale was nowhere to be found on the packaging. Anyone who has shopped for sheets knows that you really don't know what you've got until the sheets have been laundered. So, I washed the sheets following the instructions on the tags. As soon as I took them out of the dryer it was clear that these were not the percale sheets I had been looking for. Same with the extra pillow cases I ordered. BTW, the pillow cases were shipped separately from the sheets and was under a different order number. Several days later the sheets arrived. So, two shipping charges, two order numbers even though I ordered them all together. When I decided to return them I was informed that I would be charge an approximate restocking fee of almost % on each order. I still have the sheets. As I mentioned, this was my first order from overstock. It is also my last. Buyer beware. Great sheets, don't hesitate to buy. So comfortable and fit deep pockets, I love the feel of cotton. The sheets are soft, well made, fun and perfect for our bed. We have these in our Bed and Breakfast in Mendocino, Ca. Great look, love them too. Wish there were more to choose from, like Seagulls or starfish. "The mattress depth is not mentioned, not that I could see. People have mentioned different depths but they vary and confuses me more. Does anyone have the original packaging of a KING & TWIN sizes? Are these sheets soft & smooth against the skin? (I understand they are not Silk, Satin or Sateen...just not rough when you run your hand over it) Thank you all in advance"
These will fit up to an 18 inch mattress These are 100% cotton percale, woven single ply which gives them an extra soft feel. These were misleadingly advertised as Deep Pocket, however the twin fitted will only fit up to about 11” depth mattress. Very disappointed as I bought them on the basis of the answer which stated they would fit up to 18”. More complete information needed in product specs. Returned. "Can you order additional pillow cases"
Pillow cases are not available separately. "Has anyone purchased the sheets with the white background and thin blue lines that run horizontally and vertically? (Shown in the middle of left pile on picture?) Please, what is the name of this print? Customer care thought it was woodblock but they keep sending me blue fish." "Are these sheets cool or do they feel hot? We live in humid"
These sheets are very cool. I am always warm/hot and these sheets really do the trick. Cool. Crisp. Nice quality too. They stay cool enough for me. "I want the blue fish pattern and it does not have a name so I don't know what to order." Sorry I do not know. I ordered the one with the blue stripes and lobsters for my son. "the extra long and the regular twin sheets have the same dimensions... will you check to see if the xl is actually longer?" "How deep is the pocket? 20"?"